Last Sunday, I held my mothers hand as she took her last breaths. My heart is heavy but I am so grateful for the time I’ve had her. She was and always will be my rock. Today we say goodbye, but I know that one day we will be together again. I finally broke down and bought some real Chalk Paint. Compared to my diy version, it was much easier to work with. I’ve had these nightstands for a couple of years now, which are originally from Bombay and Co. The best part is that I painted them right in my bedroom! In early September I took a vacation by myself. The first time ever and I really liked it. I said goodbye to my ektorp sofa and hello to an apartment sized Kincaid sofa (used, but in pristine condition). It’s down filled and has a very subtle houndstooth pattern. I have to tell you, I miss my Ektorp and a new one may make it’s way back soon. A couple of new coffee tables too. I bought one of these LaBarge brass hoof footed tables a couple of years ago, and regretted selling it. I was lucky enough to find another one! That’s about it for now. I hope you have a great Sunday! My deepest sympathies and heartfelt condolences on the passing of your mother. There is nothing like the love of a mother and the close relationship between mother and child. It's been nearly 12 years since my mother passed from cancer, though it seems such a brief time has passed. May you find comfort in your memories of her and the love of family. Missed you! My sincere condolences on the loss of your mother. What a comfort for you both that you were with her when she passed. All your new furniture looks lovely. You bought chalk paint and I got rid of mine! I decided I prefer my good ol' Sherwin Williams.thanks for your update. May I ask where the carpet is from? So pretty! Hi Joy! Thank you so much. I'm going to respond here as I don't have your email address. How did I miss this post? Ugh! Mel, I am so sorry to hear about your mom's passing. It is never easy, and I am sending you a big hug my friend!! I love your chalk painted nightstands, and like you I made my own chalk paint...but sometimes the pre-made stuff is the way to go! Where was your vacation? Bermuda? It is so good to get away isn't it, it's good for the soul! Love your new sofa, but I love my Erktorp too! 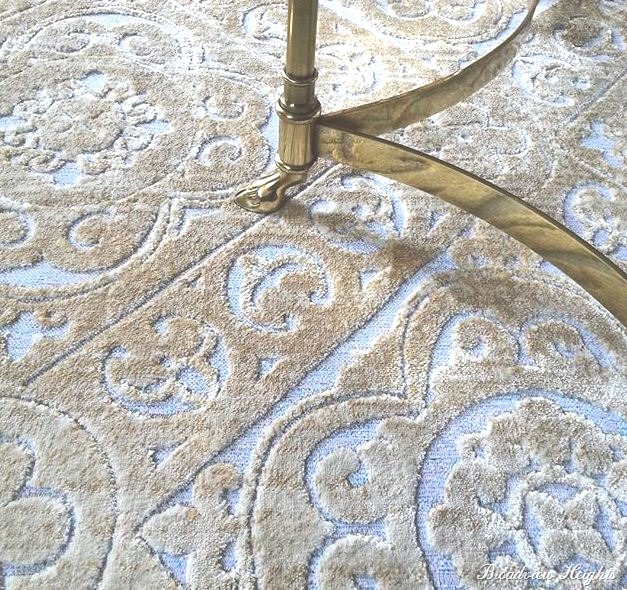 And that rug, so, so pretty! Love it, and what a steal of a price! And your brass table, beautiful! You score some amazing furniture pieces!! I hope that you had a wonderful Christmas and New Year's Eve Mel! Wow ! Loved the Interior design content of your blog Mel! Will keep on visiting for more.